We'll continue on in our journey through the great book of Revelation by getting our teachers together to discuss Chapters 1-3. Feel free to watch, listen, or read along by clicking one of the icons below. 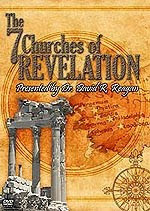 Dr. Reagan: Let's get into a discussion now of these first three chapters of Revelation. The first thing I'd like to emphasis is the fact that in the first chapter Jesus appears dressed as a high priest. Do you see any prophetic significance in that whatsoever? Dennis Pollock: I think that is reveals Jesus' present day ministry. He is serving as High Priest. A lot of people talk about Him being King of Kings and Lord of Lords, well, ultimately He is that, but right now His present day ministry is as High Priest. Look at the book of Leviticus for example. Look at what it said about the priests and how it talks about them making atonement for sin. It would also talk about individual sins. One would come to the priest who'd make atonement for the sin. They'd be forgiven. The high priest would also make atonement for the whole nation of Israel on the Day of Atonement. Jesus as High Priest, He deals with sin right now, but the wonderful thing is He does more than just make an atonement. Atonement means covering. Their sins were covered in those days, but Jesus has made a cleansing. So, He is serving right now, functioning as High Priest. He's going to come back and He's going to come back as King of Kings and Lord of Lords. Dr. Reagan: Now, don't you think this is a pretty hard knock for those who have the Amillennial viewpoint? As you know, the majority viewpoint in Christendom today is the Amillennial view, which is the view that Jesus is reigning as King of Kings and Lord of Lords right now. Well, doesn't this pretty well knock that in the head when He appears as High Priest? Don McGee: I think it very clearly indicates that Jesus is not working as a King today. If Jesus were a King today we would not have an advocate with the Father. The French people in south Louisiana refer to this as "Jesus being our advocate," which in their terms means "attorney." And what Jesus does is He sits at the right hand of the Father and He intercedes on our behalf, which is what an attorney does in a court all the time. Jesus is there interceding on our behalf as an advocate, as a high priest if you will, and not as a king. Dennis Pollock: Right. He's king of our hearts, but He's not a political king. He's not the king of the world at this point. Dr. Reagan: I often say to those who try to argue with me that Jesus is King of Kings and Lord of Lords right now, that if He is He's doing a very poor job of reigning over this world because all the nations of the world are in rebellion against Him. Don McGee: I don't need a king right now, what I need is someone to stand in my stead before the Father, that is what I need. Dr. Reagan: I mentioned 13 glorious promises that are made to overcomers in Chapters 2 and 3. It's amazing how many promises are made there. And, for example, in Revelation 2:7 it says, "He who has an ear let him hear what the spirit says to the churches, to him who overcomes I will grant to eat of the tree of life which is in the paradise of God." That's pretty obvious a promise of eternal life in that we will have access to the Tree of Life. But, there are 12 other promises there and what about those promises? Which ones jump out at you? Which ones would you like to comment on? Don McGee: The 11th verse of chapter 2 is interesting to me because it speaks about he who overcomes shall not be hurt by the second death. This is something that can be kind of confusing if you don't look at everything the Bible says about this. In the Ephesians letter in chapter 2 it says that, "And you when you were dead in your trespasses and sins in which you formerly walked according to the course of this world." On and on and on, this indicates that we were born with a propensity or an inclination toward sin. And, when we got to that point in our lives where we understood that we were sinners before God we were dead. It's a spiritual dead. The word "death" there means "a separation from God." So, we all died once. Every person that's ever been born dies once. The thing that we have as Christians is that if we die twice, if we die to ourselves and have Christ as our intermediator, then we don't have to face the second death, which is eternal separation from God mentioned in the book of Revelation. Dr. Reagan: That's a wonderful promise, a wonderful promise! Is there another one there that jumped out at you, Don? 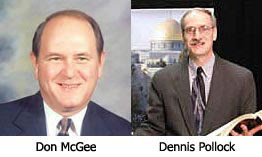 Don McGee: The idea of God having us reigning with His son Jesus. When we reign over the nations, I can't wait for that. That is a wonderful promise! I think it's one that we don't think about very often because it has to do with the physical world. So many times we believe that this idea of salvation and heaven and all that kind of thing is so spiritual. It's almost like we're apparitions on a cloud kind of thing. But, this idea of reigning with Christ is something that is literal. It's real. It has to do with the earth. It has to do with time and space and activity and people and circumstances, and we are going to participate with Christ in that reign. Dr. Reagan: What do you say to those who claim that we're reigning with Christ right now? Don McGee: Well, I don't see that. I'm not having a whole lot of influence being an administrator for Jesus Christ today. I don't think anyone else is either. Dr. Reagan: You know, this promise is so important, Don, and I think we ought to read it. It's in Revelation 2:26 where He says, "He who overcomes and keeps my deeds until the end, to him I will give authority over the nations and he shall rule them with a rod of iron." Now, I don't know how you can spiritualize that into saying that we're doing that today. We're not ruling over the nations with a rod of iron. Don McGee: We don't have authority over anybody right now. Dr. Reagan: Well, that's right. Don McGee: And, the word "nations" has something to do with people, not the demonic spirit world. Dennis Pollock: Well, pretty much they all do. I mean, it's an incredible section of Scripture and one that we would all do well to study. One of the ones that I like is where he says, "I will confess His name before my father and before His angels." You see, right now the confession is on us. We are to confess right. A very important part of knowing Christ and being born again is confessing — believe in your heart and confess with your mouth the Lord Jesus. And, that's what we're to do. But, the day is coming when it's going be reversed and we're going stand before God and Jesus is going to confess us. He's going say, "That one is mine." I don't think there'll be any sweeter words we'll ever hear than to have Jesus acknowledge we belong to him. What a privilege. Dennis Pollock: The other one that I think is so amazing, and is really one that when you first read it it's a little puzzling. Jesus says, "I'll make them a pillar in the temple of my God." They'll go out no more. Well, you think about a pillar. What does a pillar speak of? It speaks about stability. How many times have you seen pillars hoping around the streets? They don't go anywhere. They're stable. They're strong. Some people wonder, "Well, what if we get to heaven and a thousand years later we blow it and then we end up losing it all?" No, you'll be a pillar in the temple of God. You aren't going anywhere! Pillars are important, vital part of the building. Paul talked about Peter and some of the other apostles being pillars in the church and we will be pillars in God's family, in God's household for eternity as overcomers — an incredible declaration of the importance of the saints in the eternal realm. Don McGee: That's interesting. You know, Jesus is the cornerstone. Don McGee: I like that, I like that. I never thought of that before. Dr. Reagan: One that I like is in Revelation 2:17 where it gives two promises. "I will give to the overcomer a white stone and on that stone will be a new name." The white stone comes from the fact that in that day and age when people were tried before a court and the jury went out and made the decision, the jury foreman would come back and the person would walk over and hold their hand out. If they dropped a black stone, it was guilty. If they put a white stone in their hand, they were innocent. We're going be given a white stone. That means that all of our sins will have been forgiven and forgotten as far as God is concerned. They are put as far away as east is from west and the deepest part of the ocean, and we will be innocent before him. Also on that stone is going be a new name. God loves to give new names. Throughout history he's given people new names. He gave Abram a new name and Sarah a new name and Jacob a new name. He gave Paul a new name. He gave Peter a new name. He loves new names. And, I think we're going have new names for eternity. It's going be interesting to look at that stone and see what your new name is. I have a suspicion it's going be related to our walk right here and now. Wouldn't it be great to look and see and it says your new name for eternity is Perseverance or Faith. Wouldn't it be terrible to look at your new name for all of eternity and it says Wishy-Washy. Dr. Reagan: Another of these promises that jumps out at me is in chapter 3 verse 21 where it says, "I will grant to the overcomer the privilege of sitting down with me on my throne as I also overcame and sat down with my Father on His throne." Jesus is going to let us sit with Him on His throne! Now, the day's going come when you're going sit at the right hand of Jesus on His throne. I'll have my day, Dennis will have his day. That's just almost beyond my comprehension. And, the interesting thing is He says, "I'm going do that just as my Father has allowed me to sit with him on his throne." This gets back to a very important theological point. The point is that those who have an Amillennial viewpoint, those who believe that there's not going be any future Millennial Kingdom and who believe we are in the millennial now, believe it or not, they argue that Jesus is reigning as King of Kings and Lord of Lords on His throne right now, but the Bible teaches He is sitting next to His Father on His throne. And, Jesus says one day I will sit down on my throne, which indicates He's not on that throne right now. What is His throne? His throne is the throne of David. Where is that throne? It has always been one place — Jerusalem. Jesus is coming back to reign. Don McGee: That's what the angel said whenever he spoke to Mary. He said Jesus is going to have the throne of his father David. Dr. Reagan: That's right. And it's always been in one place — in the city of Jerusalem. Jesus is coming back to Jerusalem. He is coming back to take the throne of David. And then, and only then, is He going to reign as King of Kings and Lord of Lords over all the earth. Well, those are certainly thirteen glorious promises, and as I said before, they are all made to a group of people called "Overcomers." And again, according to 1 John 5:1-5, an overcomer is one who puts his faith in Jesus as Lord and Savior. Dennis Pollock: What about you? Are you an overcomer? Are you an heir of these wonderful promises? If not, I want to urge you to act now before it's eternally too late. Reach out to God in faith, confess that you're a sinner, and receive Jesus as your Lord and your Savior. 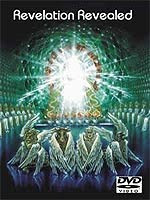 In the next part on this series on Revelation, we'll get an awesome look at God's own majestic throneroom in Chapter 4.